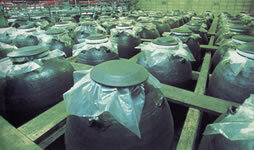 These are widely used for Sake and Shochu. This has very low forming Arginine, which is one of amino acids having bitter taste. Because of that, Sake with harmony between scent and taste is made. This has low productivity of isovaleraldehyde which is a precursor of MUREKA (smell like a cooking rice) of Namazake. Namazake is a kind of Sake and it is not heated up. Because of that, yeast and Koji fungi are still alive. This has a very strong forming abirity of leucinic acid. Sake with harmony between scent and taste is made. This is good for upper Sake as Junmaishu and Honjozoshu. Aerobic growth type. The majority fungi have strong enzymatic activities. Rapid growth in the beginning of Koji incubation period. Strongly penetrate. This is made with focusing on scent and taste. Favorable Tane-Koji for clean Sake having no peculiarity. Rapid growth in the beginning of Koji incubation period. High scent. Koji dose not make dark and black pigment. Quality of Sake is fine dry type. A little amino acids. Black pigment in a residue after squeezing Sake and dark and black pigment of Koji are not made by any methods because this Tane-Koji dose not have tyrosinase activity. 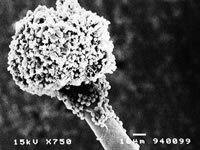 The Koji fungus which is apt to be Tukihaze (several white spots of fungal colonies on the surface of the rice grain with abundant mycelia penetrate deeply into the interior of the grain) is chosen. Completed Koji has good penetration and it is roundness. This is more effective with lamellar mechanical production of Koji or lid Koji. Strong enzymatic activity. A residue after squeezing Sake is small and high economical quality of Sake is got. Slow growth in the beginning of Koji incubation period. High tyrosinase activity. This has a strong liquefying ability. There are rapid growth in the beginning of Koji incubation period (type A) and slow growth in the beginning of Koji incubation period (type B). This prevents coloring of Sake by iron. 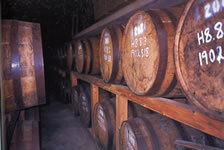 Color of Sake is not more than half of the Sake made by contrasting Tane-Koji for Moromi. This is isolated from rice-Koji for the first time in Japan by Ahlbrug in 1876. Tukihaze (several white spots of fungal colonies on the surface of the rice grain with abundant mycelia penetrate deeply into the interior of the grain) is got which has good scent, good color, good breaking up and good balabced-enzymes. The rising of article temperature is comparatively earlier than high-gluco fungi, and glucoamylase is high. Pure white, roundish and Tukihaze type (several white spots of fungal colonies on the surface of the rice grain with abundant mycelia penetrate deeply into the interior of the grain) of Koji is got. α-glucosidase is strong. This is strong against high temperature after the last mixing and dry type Koji is got. Amylase activity is very strong. Peculiar flavor of Mirin is apt to be made. This is the most frequentry used and typical one in Shochu Koji. It has stable enzyme and citric acid productivity. Without well tightness. Because this has higher production of leucine than white-Koji fungus for Shochu, it is possible to reinforce aroma of Shochu. With well tightness. This has higher β-glucosidase, the property of sweet potato is well appeared. This has less 'prolix taste' coming from black spore. Mild taste. The oldest Shochu Koji fungi in Japan. This is isolated from Awamori in 1901 and this is a right type with low acidity. There is proper flavor of yellow Koji which white and black Koji do not have. This is the mix culture of Asp. luchuensis and Asp. saitoi. It gives Shochu flavor unique to Awamori. In the second mashing, sweetness of potato-, rice-, barley- and brown sugar-Koji is incｒeased by adding dried and crushed rice-Koji (Aspergillus oryzae). Consumption is 5kg per 200kg of second mashing raw material.